The best hair stylists are at HM Spa & Salon. Go from drab to fab in one visit. We are a certified L’Oréal professional hair salon. From short to long, thick to fine, and winter to summer, we offer the perfect hairstyles for any age, hair type, and occasion. Bob styles of all kinds – short and shattered, A-line, inverted, modern angled, classically textured, chin length, and classic with a ‘tude. Round face? Long Face? Short face? Thin face? We can style and shape your hair to accent facial features that’ll WOW you and your friends. What’s The Price of Hairstyling at HM Spa & Salon? Each stylist at HM Spa & Salon has their own specialty, talent, limitless wonder, and the freedom to set their own value. HM Spa & Salon has highly rated hair stylists with loyal client bases. Katrina’s journey with beauty began in her grade school bathroom. Using her mother’s makeup (shhhhhh) she gave makeovers to classmates, and thus her love affair was born. 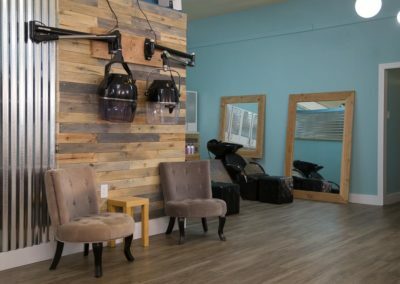 Trained at The Salon Professional Academy (now Summit Salon Academy) and a certified L’oreal Professional Expert Stylist, she is an avid believer of on-going education. Regularly attending trainings to master her craft, she is committed to constantly learning new techniques and trends. She prides herself on her natural attention to detail. Her specialties include: sun kissed highlights, ravishing reds, and perfectly tousled beach waves. She takes time to connect with her clients, and believes that the better you get to know someone the better you can truly accommodate their needs. Katrina sees the beauty in everyone she meets, and strives to make sure each client leaving her chair will see and feel it too. She truly enjoys what she does! So much that she even misses it when she’s on vacation.